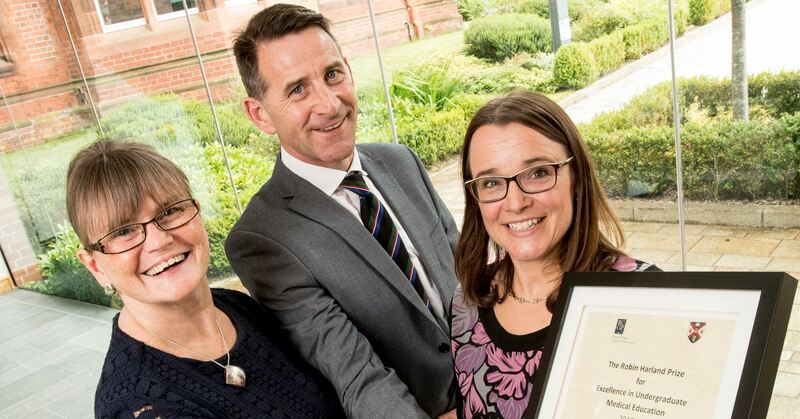 Queen’s University has presented Dr Gillian Millar from the Harland Medical Practice in Belfast with the Robin Harland Prize for Excellence in Teaching for Undergraduate Medical Education. Each year, Queen’s fourth year medical students nominate a GP surgery and GP Tutor for the Robin Harland Prize for Excellence in Teaching. Dr Robin Harland OBE contributed greatly to the University both in his role as Senior Medical Officer for over 20 years as well as a member of Senate. The award was set up in his memory in recognition of his contribution to the University following his death in 2012. In the fourth or penultimate year of a medical degree, students spend three weeks in a GP surgery where students work alongside a GP tutor to get a real insight into the profession. The placement is key in enabling students to develop an understanding of the demands and diverse range of skills required for the profession. Dr Nigel Hart who is one of the coordinators for Queen’s medical student placements at GP surgeries across Northern Ireland added: “The Robin Harland Prize for Excellence in Teaching recognises the great work that our GP tutors and their Practice teams do in training and preparing our future doctors. The GP placement provides students with a great opportunity to understand the breadth of skills and variety of demands that this job requires. Caption: Dr Grainne Doran, Chair of the Royal College of General Practitioners, Dr Nigel Hart from Queen's University and Dr Gillian Millar from the Harland Medical Practice.